The crowds and kerbside barriers which brought most of the British team to a standstill. PARIS, France -- In a surprise result, a British rider has snatched cycling victory from the French on their home ground. This in spite of most of the UK team encountering an impassable barrier literally within sight of the finish line. As the victorious Wiggins commented, "The [British] team are superb cyclists but seemingly hadn't ever taken part in the finishing stage of a Tour before, and presumably didn't know what conditions to expect as they neared the line. Thus, a tactial blunder led to them being delayed for several hours, in fact until the race was over and the crowds had dispersed. Meanwhile, I and my race-buddy Cavendish understand well the conditions here and know how to play the game by French rules. Therefore we just sailed past my teammates to victory." 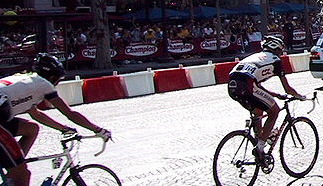 It seems that problems for other British riders had started on the approach to the finishing line in central Paris, when they were faced with a lengthy delay at the Rue de Tivoli pedestrian crossing. "We were dutifully waiting for the red, and for some people to start crossing in front of us," commented the team leader after the race, "but it never came. What we hadn't appreciated was that the lights had been turned off for the race." Eventually a race official went over and told them to proceed. This simple misunderstanding had cost them most of their hard-won lead over the French, but victory could have still been theirs, given no more mishaps. Looking back to their amazing performance on the preceding sections of the Tour, it's obvious that the British team has done a great deal of training and preparation for the event, and that this was largely what gave them their substantial lead, which they held unchallenged almost to the finish. One point of interest was the decision to ride the course on the lefthand side of the road. Whilst that might seem like a refusal to follow local custom, it was appparently based on the fact that in the UK most cyclists ride on the right, except in one way streets where they ride in the middle, sideways, backwards or any damn way they like. Thus, under Continental road rules it was felt that they should do the equivalent. Training had apparently included special courses on weaving rapidly between obstructions such as the tables and chairs which thoughtless restaurateurs often leave in their path, and jumping the bike over kerbs without slowing. An item which was not overlooked was the need for a fluent ability with French argot and gesturing, necessary to deal effectively with any pedestrians obstructing their progress. Motorists were advised not to drive alongside competitors in case the temptation to hitch a lift became too great. An interesting aside, the Fédération Française de Football Américain report that sales of specialist clothing have rocketed since the British team announced their intention to take part. The hopes of the British team were, sadly, dashed at the turn into the Champs Élysées, at which point dense crowds of spectators completely blocked the team's path. None of their carefully-planned repertoire of stunts proved to be any use in getting past or through this human obstacle, either. In sheer desperation, some of the team members even took a great risk in attempting the unthinkable for any British cyclist, to ride in the roadway. This tactic also proved impossible owing to the tall crowd barriers erected alongside the kerb. Thus they were brought to a complete halt, and had to stand watching helplessly on the footway as their countryman rode past to victory only a few feet away on the road. The British team say that they aren't in the least discouraged by losing to one of their own countrymen using controversial French riding skills such as roadway riding, and will definitely be taking part again next year. When asked what changes they might make for next year's race, they dismissed roadway riding or greenlighting as 'way too radical and risky.' They nevertheless mentioned BMX cycles and practice at jumping onto and riding along the tops of crowd barriers as a means of tackling the finish-line problem. As a BBC commentator added, "Britain, for so long not a road-cycling nation, is flexing its leg-muscles."